Remember Jimmy Stewart in the classic movie "It's a Wonderful Life"? Well, Newsmax magazine went out to discover the towns and cities that are modern-day "Bedford Falls" — the fictional town that made George Bailey (played by Stewart) such a great American. Is your town or city one of America's best with American values? Or is it a Pottersville — the bad town Bedford Falls almost became. 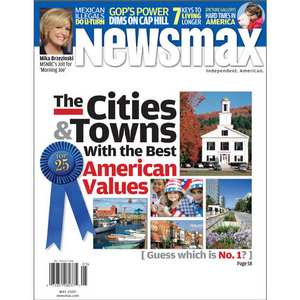 Now, Newsmax magazine's special report, "The Cities & Towns With the Best American Values," answers that question for you. Now you can find out the cities and towns that best embody America's traditional, core values — great places for you and your family to live in as well as wonderful places to visit. This special Newsmax ranking of cities and towns was compiled with the help of Peter Greenberg, Travel Editor of NBC's "Today" show and a New York Times best-selling travel author. Greenberg helped ferret out the best 25 locales in America. In assembling his list, Greenberg focused on a town's public spaces, civic events, proximity to medical care, churches, and school curricula, and ranked the locales in categories including hospitality, wholesomeness, culture, scenic beauty, family-friendliness, devotion to religion, and education. Each of his selections is indisputably great and uniquely American. Guess which is No. 1? The town with the "best Old West spirit"
The port dubbed "American's most patriotic town"
Bon Appetit magazine's "foodiest small town in America"
Seneca Falls, N.Y.'s connection to "It's a Wonderful Life"
The community called the "unofficial home of the U.S. Military"
The original home of "Uncle Sam"
Exclusive profile: MSNBC's Mika spars with "Morning Joe"
Obama & Co. stepping out in D.C.
Where have all the John Waynes gone? U.S. on "brink of wireless nirvana"
Ruddy: Where has Milton Friedman gone? Again, there is so much more in Newsmax magazine, which won a Gold Eddie Award in the News/Commentary category of Folio magazine's prestigious journalism awards, the Eddies. Ben Stein says Newsmax reveals the "unafraid, uncomplicated, bare-knuckles truth about today's dangerous world." And nationally syndicated radio host Michael Reagan, son of the late President Reagan, says: "I guarantee that you'll love Newsmax magazine. The liberal media moguls hate Newsmax." 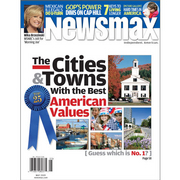 Find out why more than half a million people read Newsmax magazine each month. Special Bonus: If you are not a Newsmax magazine subscriber get this edition PLUS a 3-month free trial subscription to Newsmax magazine — a value of $15!